If you couldn’t attend Microsoft Build 2018, now is your opportunity to do so online with Microsoft Build Live 2018. Learn about the cloud, AI, IoT, and much more. But as you browse the hundreds of recordings available, you may find it overwhelming to find the things that are the most relevant to what you want to learn. That’s why we organized select content into playlists. 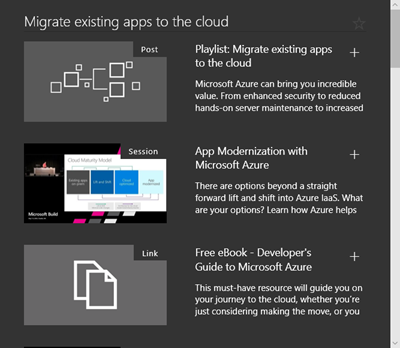 Migrate existing apps to the cloud - Learn the best strategy and which tools to use for migrating your infrastructure and applications to Azure. 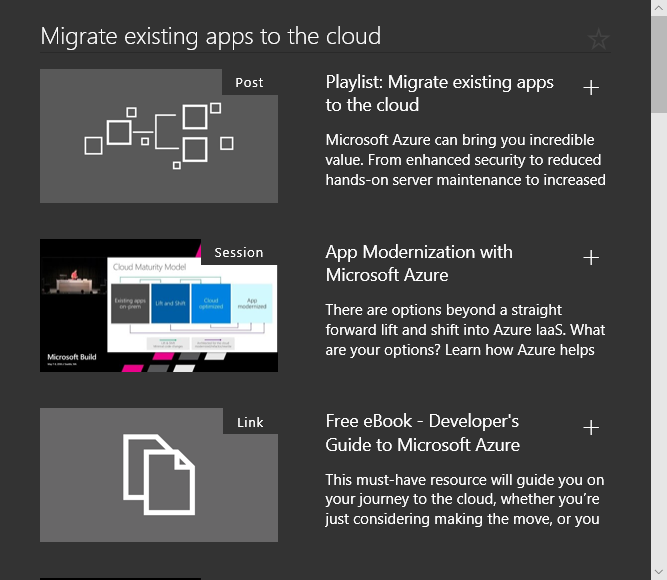 Extend existing apps with cloud services - Learn how to take your applications to the next level by using your current skills to use Azure services and let Azure do the heavy lifting for you. Learn to build cloud-native apps - Learn how easy it is to create a cloud-native application in Azure that is intelligent, performant, highly-available, and cost-effective. Add intelligence to apps using machine learning and AI - Learn how to use the power of Azure to perform machine learning or consume it as a service and add artificial intelligence to your applications. Continuously deploy and manage apps at scale - Learn how to release new, higher-quality versions of your application to your users more often by using existing tools that make your life easier. Build IoT apps in the cloud or on the edge - Learn to use your existing skills to enhance the physical world with software using the Azure IoT offering. Get inspired by Microsoft innovations - Learn about the new and exciting technological innovations that will shape the future and how you can be a part of that future. Build apps and automate processes with PowerApps and Microsoft Flow - Learn how to use PowerApps and the Business Application Platform to build apps or extend capabilities with custom connectors, custom controls, Azure Functions, and more.